Prince Charles got in a royal flush yesterday(27 July 2008 ) as streakers caused uproar at a polo match. Charles and a celebrity-packed crowd watched as the trio ran naked from the grandstand and sprinted on to the turf during a match between England and Australia at Windsor Great Park. Two of the streakers were swiftly grabbed and away - as one official joked: "We do have a dress code here." But to the delight of the cheering spectators, the third man gave stewards the runaround. 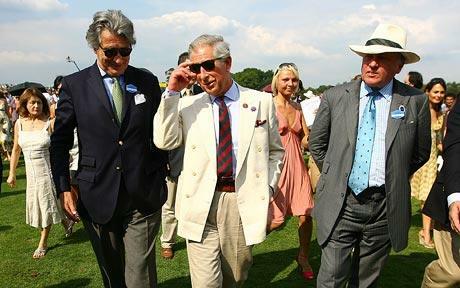 Three male streakers invaded the pitch being watched by the Prince of Wales during an annual soc iety polo event. The naked trio emerged from the grandstand during a match between England and Australia at the Cartier International event in Windsor. Two returned to the stand but the third was cheered as he fled stewards and hurdled two metal barriers to escape. Prince Charles, who was overseeing the event in place of the Queen, watched the spectacle from the royal box. The Cartier International, held at the Guards Polo Club within the grounds of Windsor Great Park, is one of the most glamorous dates in the social calendar. Some 25,000 people attended the event, which took place on the hottest day of the year so far. As they floundered after him, he even cheekily bent down to touch his toes in a mock exercise stretch. Then he nimbly jumped two fences and ran off. Charles, who was overseeing the annual Cartier International match in place of the Queen, watched the fun from the Royal Box alongside Bond girl Rosamund Pike and Harry Potter actress Emma Watson. Singer Natalie Imbruglia, burlesque artist Dita von Teese, model Kelly Brook and actress Stefanie Powers were also in the crowd at the Guards Polo Club. With an air of cool sophistication that belied her age, the star of the Harry Potter films Emma Watson managed to stand out even amongst the cream of high society. The actress, just 18, maintained a look of unflustered elegance as temperatures soared above 80F at the Cartier International Polo Day, an event that has come to even outshine Royal Ascot Ladies Day on the social calendar. Prince Charles oversaw the annual match between England against Australia held at the Guards Polo Club within the grounds of Windsor Great Park. Three male streakers invaded the pitch watched by the Prince of Wales at an annual society polo event today. During the final chukka the trio stripped off, emerged from the grandstand and ran on to the turf during a match between England and Australia at the Cartier International event at Windsor. Two fled back into the stand but the other drew cheers from the crowd as he sidestepped chasing stewards and hurdled two metal barriers to escape. The Prince of Wales, who was overseeing the event in place of the Queen, watched the spectacle from the Royal Box where celebrities including Bond girl Rosamund Pike and Harry Potter actress Emma Watson were also sitting. Charles, wearing a cream suit and sunglasses, walked out at half-time to join in the tradition of stamping down the divots on the field caused by the horses’ hooves. Despite the streakers’ intervention, which temporarily halted play, England went on to win 10-9 and lift the trophy. Afterwards England team captain Luke Tomlinson said of the streakers: “It is not the first time I have played in a match where we’ve had a streaker and you are so focused on the game you hardly notice. A spokeswoman for the club said: “I think it is the hot weather and the Pimms to blame. These things happen. The Guards Polo Club, one of the most prestigious in the world, is based at Smiths Lawn, in Windsor Great Park, near Windsor Castle. The Duke of Edinburgh has been President of the club since its formation in 1955 but he is not so keen on the noise and crowds of the club’s biggest event. The Queen and the Princes Harry and William may have been absent but the day was still blessed with the kind of mixture of Royalty, celebrity and aristocracy that only a British establishment event can muster. The prestigious Cartier tent, this year designed by Nicky Haslam, the Royal posse did their best to make up for their missing friends. Sam Branson, Sir Richard's son, sporting a new mohawk, Tom Van Straubenzee and Guy Pelly feasted on lunch prepared by celebrity chef Anton Mosimann (scallops, followed by rack of lamb), washed down with industrial quantities of Cartier's Cuvee. Across the field at the Chinawhite tent, an edgier crowd led by the supermodel Agyness Deyn, Miss Watson and shoemaker to the stars Jimmy Choo chilled out to music by DJ Mark Ronson, the man credited with catapulting Amy Winehouse to stardom. As always, few of the 35,000-strong crowd present paid much attention to the game. 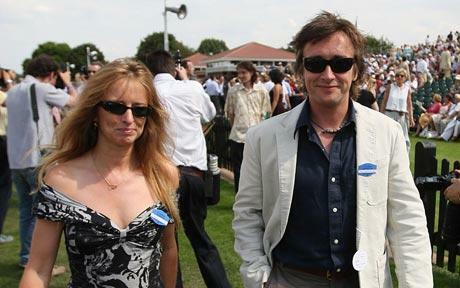 And as always, the guests from the two reigning hospitality tents, barely left their cossetted confines. But the heat did take its toll. 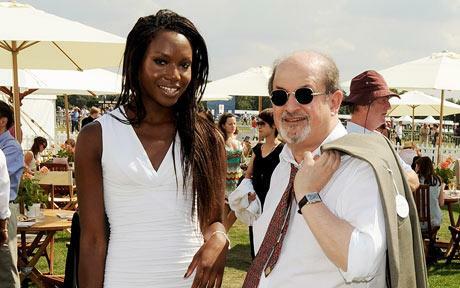 Alongside the paying public, the Rothschilds, the Bransons, the model Caprice, Salman Rushdie and his female consort soon began to show signs of discomfort, their carefully considered outfits wilting in the heat. Frenzied fanning followed with programmes or serviettes, anything guests could get their hands on to fight the perspiration. Some even took to their air conditiojned cars for a break from the sun, while used umbrellas shield them from the sun. Match-goers took advantage by holding picnics and sipping Pimms on lawns surrounding the grand stands. Among those attending were pop star Natalie Imbruglia, rugby star Matt Dawson, Top Gear presenter Richard Hammond and Bond Girl Rosamand Pike. It was only when the sun finally went down that the disheveled crowd cut loose, with festivities continuing at Mayfair nightclub Whisky Mist. Load XP on a Vista Computer! The Great Cricketer With Real Buddhist Mind !